"Fabulous week at Lake Salem with my family. We saw 3 loons, 2 eagles, 1 bobcat and 3 deer. Our days were filled with swimming, fishing, floating, boating, reading, drawing, and board games. We made our tradition outing to Evansville Trading Post, The last night we were here my family and friends came by for a pot luck dinner. The night ended with a bang, some laughter and good bye tears. Until we return, smiles, peace and blessings." "Great weather, no rain at all, good fishing, the dogs enjoyed the water. We saw a bald eagle having breakfast on the sand bar, great blue herons and many geese. 2012 marks my 50th year here at Lake Salem Cottages. We love it here!" "We had a wonderful week here at Lake Salem again this year. We enjoyed some nice sunny days with lots of swimming. The fireworks around the Lake on the 4th were fantastic!" "This was our first visit to Lake Salem and we had a great time. Beautiful sunsets and delicious breakfasts at the Brown Cow. We hope to be back next year"
"We had an enjoyable vactaion this year at Lake Salem. Scott and Liam took the Bass tracker to Derby Pond and Lake Memphremagog in search of fish. Duncan took his kayak to Little Salem and the Clyde River and caught a few bass. As always, the weeks go by too quickly and we are sad to return home. Until next year." "Our fouth summer here but our first with all five kids!!!. Alison(8), Anne(6), Claire (4), Christian (2) and Darcy (2) had lots of fun swimming, playing in the sand and going for rides in the rowboat. Sunny all 7 days. See you next summer"
"We just wanted to say thanks again for another fabulous vacation. They just keep getting better and better. The weather was great and it was such fun to be there with all of our family and friends at the same time. We appreciate all of the effort and time that went into organizing that for us. We were really surprised to hear of the crazy flooding that happened there this spring. We saw a bunch of photos from the Johnsons and couldn't believe the water levels. I can only imagine the work that went into getting the cottages back into shape for the renters. We appreciate the work that Rob, Lewis and John did. Lewis said they worked from 7am-9pm six weeks straight. Unbelievable!" "We had a fantastic vacation here at Lake Salem. The weather was perfect. The sky was full of huge billowing clouds over the lake-spectacular. The evenings brought a parade of beautiful sunsets. Our cabin was a cozy home away from home to return as we explored the scenic areas of this great Northeast Kingdom. We successfully rowed across the lake and back two times. I loved the rowing. We all loved the boat rides, the Play at the Opera House in Derby Line, feeding the ducks, seeing great wildlife, herons, loons, geese, sand piper, and fish. The accommodations were great. We had everything here we needed. Lake Willoughby, Seymour Lake and Island Pond are great lakes to visit too. PS. Eastside and Jennifer's Restaurant were fantastic"
“Wanted to say how much I enjoyed my week in VT. Lewis was a big help. Was a real trip down memory lane and was surprised to see it looks remarkably like it did. I hope to do it again next year, probably the same time. Fishing was decent, my dog enjoyed the lake. Thanks." "The Lahan's spent our third good year here at Lake Salem. Cousins from Virginia re-united with Vermont cousins amid great squeals of laughter and memory making." "We had another great week—it went as fast so fast as always. My three year old son is beginning to love this lake as much as we do. He had a great time playing with all of his cousins in the cottages on either side of us. The fishing was GREAT this year. For the first time in 32 years since I was a young child we were able to catch nice bass from the dock. I’ve never seen the water level so high. Look forward to returning." "We are so happy to be at Lake Salem again! Steve caught and released lost of fish including a trophy size small mouth bass. Once again, he used a fly rod and flies for most. We saw a lot of wonderful wildlife: loons, herons and the cute ducks. We were thrilled to see a bald eagle twice. Most days were spent on the water. We did find time to attend Derby Line Day, which was a lot of fun. We also visited the farmers market in Newport, St Johnsbury and Island Pond for delicious fresh veggies and blueberries. We are leaving rested and refreshed. We're looking forward to returning next year." "Unfortunately, this wonderful vacation here in Derby, Vermont is coming to an end. My family and I had a wonderful time. Your cottage here is fantastic! I love the throw rugs and vintage blankets hanging from the wall. It gives the place a great feel. We took a trip up to the gorges over Willowbye Lake. It is absolutely gorgeous there." 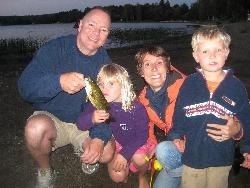 "Thank you Rob, Julie, Greg, and Madeline for all you do to make it possible for us to stay at Lake Salem. I believe this is the 50th year of being here. My father started renting from Isabel and Wayne when I was 8 years old and I am now 58. A very special thank you to Lewis. He came everyday to check on us and was most helpful. Lots of my relatives rented cottages around the lake—so we had a great time being together. The water level was very high this year- but we managed many swims in the river Bruce saw the bald eagle, osprey, great blue herons etc." "Vermont is so beautiful!! I love the mountains and the trees here. It is really relaxing. This vacation was just what we needed to break away from the busy New Jersey life we’re used to. We did a lot of fishing and caught some pretty big small mouth bass. The best place to catch them is in the river. Also special thanks to Lewis. He was very nice and always helpful. " Hmmm, have I got them all? I doubt it. Every day was great"
"This was our 30th Anniversary of our last visit to Silver Acre in 1976. There are quite a few great improvements to the cottages. This was a very nice week. Caught a large small mouth bass in the river 2 ½ lob 17 ½” and son Chris caught a good sided pickerel in the lake." "There was plenty of bird watching. Some sightings were a black tern, pied bill grebes, one immature and two mature eagles, American bitten, and a loon to name a few. Had a few nice fish Top spots go to Steve with a 16 ¼” small mouth bass caught in the river and Kath in first place with a nice 22 ¼” 4 ¼” walleye. The girls out fished they guys this year. As always our time here has gone by too fast and we're looking forward to next year already." "We enjoyed a fabulous week at Lake Salem. The weather was the best we had in years. Liam(10) and Duncan (8) learned how to water ski, too! We also enjoyed lots of tubing and the “ski Bob”. Of course, the fishing was fantastic. Scott, Liam and Duncan to Little Salem and caught tons of bass, walleye and perch in their secret fishing spot. The week went by so quickly, we cannot believe it is over already! We cannot wait to come back next year!." “We spent another beautiful two weeks here on Lake Salem. Swimming, rowing, campfires, reading, puzzles and games. Sad to head back to our busy schedule. Pat and the twins enjoyed their daily walk to the end of Hayward Rd. On the way back they always stopped at the Char-Bo store to pick up a newspaper for Mom and Beverley. We saw loons, herons, minnows and a doe with her 2 fawns”.